I remember reading an interview with Meryl Streep ages ago where she said she never ran for a bus, because there would always be another one coming along pretty soon. (I agree with the spirit of that statement but there must be exceptions: I’d swallow my pride and run for a midnight bus if that were the last bus till morning.) I try to have the same attitude about discontinued or hard-to-find perfumes too: I’ll never run after one (crying at its departure, and pitying myself for not stocking up — how embarrassing!) Not too many years ago I would have added…“because another perfume will arrive to take its place.” These days, due to the restrictions on so many perfume ingredients in Europe, perfumes won’t be arriving that can take the place of old standards of perfumery. Most new perfumes can’t conjure the past convincingly, which leads me to the topic of reissues of venerable fragrances. 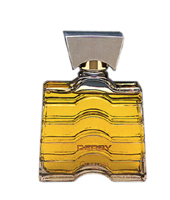 Guerlain Derby was created by perfumer Jean-Paul Guerlain and released in 1985. Sometime in the 90s, I bought Derby, unsniffed, and was not a fan (I gave it to my mother, who enjoyed it); recently I decided to obtain some vintage Derby and compare it to the current reissue in Guerlain’s Les Parisiennes collection. I hoped I wouldn’t love Derby, old or new, because the old sells for an average of $500 for a 100 ml bottle and the new is hard to come by. Original Derby, classified as a leather chypre, included notes of lemon, bergamot, artemisia, peppermint, pepper, mace, pimento, rose, jasmine, leather, sandalwood, patchouli, vetiver and oak moss. Original Derby opens with dense, syrupy lemon-bergamot (shall we say “reduced” citrus?) A rich pepper and mace accord comes next, with the first hints of leather and oak moss. As spices subside, leather and, especially, moss come to the fore (with a touch of “clove”). In original Derby’s extreme dry-down, there’s still moss present, and it’s joined by vetiver, “butterscotch” sandalwood and sweet patchouli. Original Derby is long lasting, and even a dab on the wrists produces sillage. Original Derby is a bold, heavy-hitting “adult” perfume without a hint of youthful airiness or playfulness; it’s serious. And it’s MOSSY. I like oak moss as an accent in perfumes, but when oak moss takes over a composition, I cringe. Heavy oak moss makes me feel frumpy, as if it were 3 p.m. and I was still walking around my house in pajamas: old pajamas stained with my noon breakfast in bed of last night’s pizza. Original Derby suffocates me with moss, and its “feminine” vintage vibe doesn’t suit me either — it smells old fashioned. Of the two fragrances, I prefer new Derby; it’s a nice spring-y “green” perfume. Original Derby’s heavy leather-moss combo is a no-go for me; it reminds me of an old nemesis who coated herself in Estée Lauder Azurée. So, as Derby fades into the distance, I shall remain standing at the perfume stop (non-panting, calm, dignity intact) waiting for the next arrivals. I won’t have long to wait; the perfume “bus” never takes a break, never goes on strike. (New) Guerlain Derby is available in 125 ml, in the wood-accented bottle shown above. Fernando; good luck finding one! Apparently Meryl Streep has spent her life in places with real bus service, where the buses actually do run at regular and frequent intervals. I lived for a time in San Antonio, which supposedly has a bus system. It was probably better in other parts of town, but the area where I lived was, at the time, on the very outer fringes of the city, and the bus that served my neighborhood (the only bus stop within a mile of my apartment, I might add) ran only about once an hour, and the last one was at 5:30 P.M. If you missed that one, the next bus would be about 12 or 13 hours later. Need I say, I had a car and drove everywhere I went. 50 Roses: Meryl was talking about NYC. I am wondering about the bottle depicted here (the “new” bottle, that is). I got a bottle of Derby for my husband a year or so ago, but it is in the round “bee” bottle used for the rest of the Parisiennes line, not the square bottle shown. Is this a recent change, and if so, has there been yet another reformulation to go with it? When I bought my bottle, I was under the impression that Derby was being discontinued. Butting in to say yes, until recently it was in the bee bottle. I have bee bottle Derby, too, and I prefer it over the new packaging. Sometimes Guerlain tries too hard. 50: Bee bottle has the new version of Derby…the first image is of OLD Derby. New Derby is still sold. I believe Ms. Streep went to school in New Haven Connecticut, (where I suspect she did not venture to far off campus or the campuses bus service) and has variously lived in New York City (where buses do come about every 20 minutes) and Connecticut. As Kevin notes, the interview took places ages ago. I suspect somewhere around her third Oscar nomination, Ms. Streep stopped taking buses. Maybe an occasional subway or train, which circumvent traffic problems, but I suspect she either travels by Limo, or by cab. I can’t speak to your second paragraph, Dilana, but I know for a fact that Ms. Streep’s student days in New Haven came when she was a grad student. Her undergrad time was spent mostly in Poughkeepsie, NY; at that time (late 60s), many of the students at Vassar College rode bikes to class, while some walked – no campus bus service. My brother-in-law was concerned that his teenaged daughter had the same boyfriend for too long. I told her that men were like buses; there’d be another one in 15 minutes. Are perfumes getting that way too when we see several new ones launched a day? I once ran for a bus and fell, scraping my arm and knee quite badly. I got on anyway because I had already missed one after the late shift at work. The driver told me there’d be another bus and not to run. The bus was full and no one gave me a seat so the blood on my arm marked someone’s puffy jacket. So I don’t run for buses anymore; I attempt to be there on time. Do we have to run after perfumes? They’ll be on the market for a while, if they’re any good! Hmmm, I guess I really don’t relate to buses. I have only ever had one boyfriend in my life, and he has now been my husband for 21 years. So much for a new one every 15 minutes. As for buses, being “on time” for the bus requires knowing when the bus will arrive. Regarding my San Antonio experience, I tried to find out the schedule in case I ever wanted or needed to use the bus (for example, if my car was in the shop and I couldn’t afford a rental). I located three different schedules, all in circulation at the same time, showing completely different sets of times for the various bus stops. There were no dates on any of them to indicate which might be the most current schedule. As I mentioned, they only ran about once per hour, so arriving at random and waiting for the next one could result in a very long wait. When the bus did come, it was at a time that did not match any of the extant schedules, so I didn’t know if it was running early or late. The driver would not even answer me when I asked if it was the correct bus for my stop, so I had to hope for the best. That was the first and last time I rode the bus in that town. Celestia; it does seem like there’s a new perfume every 15 minutes! Well, if there are about 1200 new releases per year (the number I have seen here), that works out to one new perfume every 7.3 hours. Well, to torture your analogy, the new buses are brightly lit, screechy, hot pink and uncomfortable. I prefer an old bus: comfortable, well-worn seats, purring motor, etc. Oh great….now I’ll be looking around to see if I can acquire some vintage Derby–thanks. I missed the last split of vintage Derby and am now regretting it – it sounds right up my alley. Great review, Kevin! Ahhhh, oakmoss . . . . surely it’s not possible to have too MUCH?!! But then again, I’m often found in my PJ’s at 3 wearing last night’s pizza under my noon hour breakfast. At 3 I’m frumpy as hell, but by 4:30 I’m fabulous (it’s a small window)!! Great review Kevin! LOL, “too much” is not enough, sometimes! I love the bus metaphor, and it helps me to bide my time with new purchases. Summer arrives late in my region and it can be too short to decide on great summer fragrances. Now that I’ve worked through the last set of samples I need to wait until the next express bus to summer before getting season appropriate fragrances . . . . The fall bus has already arrived. I’m totally into the time travel aspect of perfume, so I’m often racing to the time machine (ebay) for new (old) adventures – and usually in my pajamas! Of course, I do love many, many new perfumes, as well. On a rational (and probably spiritual) level you are right, and you do make the best case, as always. I don’t know. I think it might depend on your access to testers. I end up paying for a lot of samples, since the selection in my area is quite limited, and even driving to a store that carries a good selection of perfume to do some “free” testing requires several hours of my time and the consumption of 15 to 20 dollars worth of gasoline. Adding up my sample expenditures, and the relatively low rate of “hits”, it would probably be cheaper for me to spring for vintage bottles from eBay of perfumes I already know I love. 50 roses, I do sympathise with the horrible heat and difficult access you face in Texas, and totally agree with many of the points you’ve made here. I just wish I could adopt that Zen-like, non-clingy attitude that Kevin and some others had. Then I might be able to stop being MAD AS H*LL that J’Adore was reformulated only a few years after it came out, etc. It’s just not good for the soul! Another fine article-I enjoy the historical approach and I think it’s brave to admit your preference for the new. I know you don’t really need to be called brave in this venue, but you know what I mean. As far as missing buses is concerned, when Luckyscent responded to my request for Nicolai Pour Homme with a sample, and I ascertained they would sell me a bottle, I went for the (Big Gulp) 100 ml. Didn’t want to miss that bus. I feel more calm already. Donnie: meagre bravery for sure…but with some perfumistas ya never know what will happen? An atomizer in the neck? Not running after a bus?!? You (Meryl Streep included) are sooo Zen. How d’you manage? So, you don’t speed up to get the green traffic light? You don’t walk on the escalator? I would be just too stressed to be so calm. Just the idea freaks me out! See, now I need some Fracas, pronto, as calming therapy. The new derby sounds so not me, like the bus thingie – which is good: who needs another Guerlain lemming? Pheeew. Zazie: Seattle has zen’ed me out I guess! Thanks for the honest review. I’ve sampled the new Derby and I *think* I love it. Need to wear it again to be sure!